Scotland's Josh Strauss in their last Six Nations match against Italy. 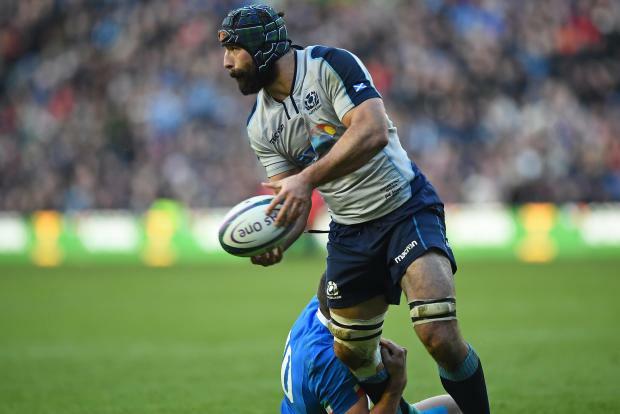 Josh Strauss has urged Scotland to take the fight to Ireland in this weekend's Six Nations clash after England showed the way by overpowering the 2018 Grand Slam winners. Eddie Jones' side dominated in Dublin on Saturday thanks to powerhouse performances from Manu Tuilagi and Mako and Billy Vunipola, running up four tries on their way to a bonus-point triumph. Strauss was impressed by the tactics used by the English at the Aviva Stadium as it sparked memories of Ireland's last Edinburgh visit. The Sale number eight was in the Scotland team for that 2017 clash, which the home side edged 27-22. "I wasn't involved last year in Dublin but we've watched a lot of the clips leading up to this year's match trying to see what we did well and where we could do better," said Strauss. "Physically we didn't match them as a team last year but in 2017 we fronted up very well. We'll need to take a similar step this week because we've seen what England have done. "If you match that you will probably get something out of the game. That is something we're focusing on." Ireland's title ambitions are already on the line against Gregor Townsend's men after their defeat to England.